Plain Kate by Erin Bow. Grades 6-10. Arthur A. Levine (an imprint of Scholastic), September 2010. Reviewed from ARC received from publisher. Katerina, called Plain Kate, had always had a special talent for carving. Some said it was an unnatural talent, but Plain Kate didn't listen to them. She had plans - to become her father's apprentice and work with him, creating beautiful wooden things. But what happened instead is that Kate's father died and left her all alone. And then the white-faced witch showed up and offered her a heart's desire in exchange for her shadow. Kate, with nowhere else to go and no one else to turn to, agrees to the deal. But what does living without a shadow mean? It's a bigger problem than Kate bargained for and she knows she must get her shadow back. Can she stop the events that have now been put into motion? Or will it mean certain death for them all? I knew from the beginning that I was in for a treat with this book. Well, ACTUALLY, I suspected that I was in for a treat before the book arrived on my doorstep because at the Scholastic preview webcast, people were gushing about this book. And the writing is very fine. It's like you're sitting there and Erin Bow is weaving this tale and telling it to you in person. It's beautiful and creepy and haunting all at once. And sad. It gets amazingly sad in some bits. It reminded me of nothing so much as Philip Pullman's The Golden Compass and once I had that thought, I kept thinking of more and more parallels between the two books. They're both about spirited, special girls (though Lyra is more feisty... if I have one complaint about Plain Kate it's that things seem to happen TO Kate rather than her taking action and solving problems herself). Both heroines have an animal companion. Both Plain Kate and The Golden Compass are fantasy adventures that are not afraid to go to some dark places. So, I'd definitely try this one on fans of His Dark Materials. I'd also try it on fans of A Curse Dark As Gold because it has that same brooding atmosphere throughout the book. Bad things are happening and you just know that things are going to get worse before they get better. A red flag for some (just so you're aware) is that there is some violence towards animals in the story. I know some readers are particularly sensitive to this, which is why I warn you (JEN). 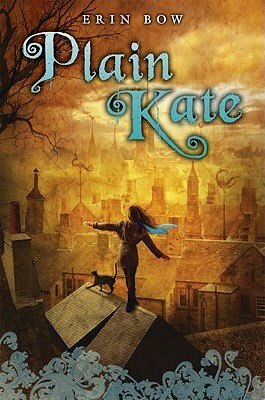 Plain Kate will be on shelves September 1. This is a YA debut that you won't want to miss! This sounds like a book I would completely love (loved A Curse as Dark as Gold AND the Golden Compass series)...though I'm a tad bit worried about the animal thing. I'm one of those sensitive to that! I'm sooo looking forward to reading this book. Thanks for a great review! Abby: would you believe this is my very first review! Thank you for the thoughtful reading. Oh, and Amanda, for what it's worth, I am also one of those sensitive to violence against animals!